Why Isn’t My Printer Working? You printed a document last night and now, this morning, your computer can’t seem to talk to your printer. What gives? It’s a common problem which has several possible causes. Check to make sure your printer is on. Is the printer securely plugged into the outlet? 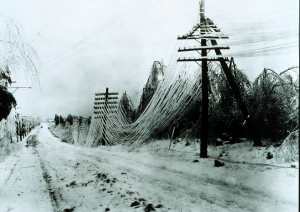 Is your house experiencing a power outage? You can try a different outlet too. 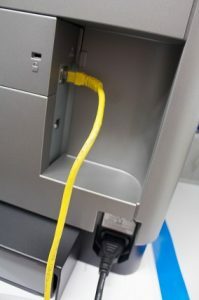 If your printer has a cable connecting it to the computer, is it securely fastened? Check the connections at both the printer and the computer. If you have a wireless computer, check to see that your WiFi is working. Does your computer have the WiFi turned on? Is the signal strong enough? Is the WiFi working on the printer? If you have a Windows machine, Microsoft sometimes sends out updates on “Patch Tuesday”, the second Tuesday of every month. (Microsoft has been talking about discontinuing “Patch Tuesday” for the past year or two, in favor of automatic updates, so this may not be a reliable indicator in the future.) Occasionally, the update will change some of your computer’s settings. Try reinstalling the printer. You can also check to make sure you have the proper driver installed for the printer. Even if Microsoft moves from a monthly update to automatic, any update can still mess with your printer settings. Turn your computer off and back on. Turn the printer off and back on. Sometimes that will reset whatever bug was preventing you from printing. If you still can’t print, it might be time to bring in the services of an independent IT professional. 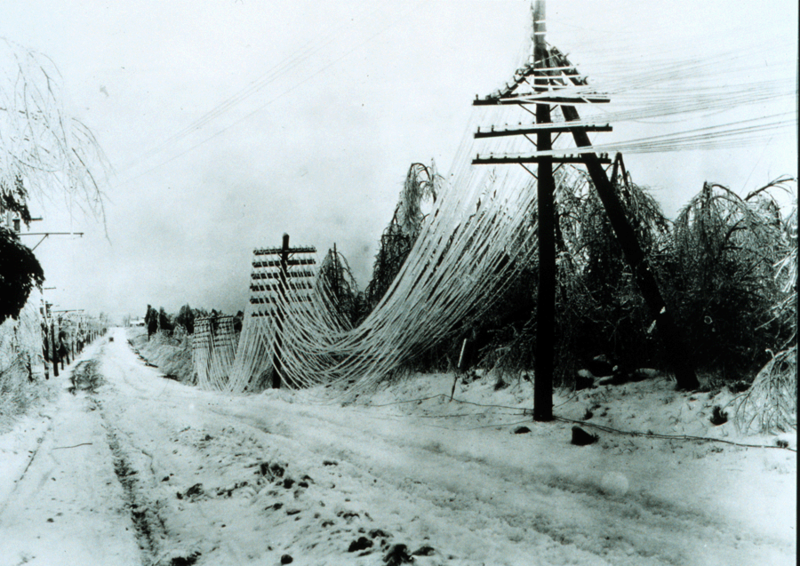 It’s winter here in Colorado and that means blown down or frozen power lines. The power goes out at our home about once every four to six weeks in the winter and we’ve learned what to do to keep our equipment safe. When the power first starts to flicker – the lights turn off for a half second or the smoke detector beeps – we go around the house and unplug everything from the wall. This includes the computers, printer, TV, stereo, entertainment system, everything that would be expensive or inconvenient to replace. What about a Surge Protector? Surge protectors are okay, because you are not always at home when the power goes out and they do provide a small amount of protection. Just know that they are not always able to provide 100% protection to all of your equipment. Remember to unplug your router as well. Many times, we’ve been called to a client after a power outage and they’re no longer able to get their internet service. Sometimes the power surge will “fry” the router and there’s nothing to be done but to get a new one. If your power had been out and you need help adjusting your settings for your printer or router, just let us know! It sure is frustrating when your WiFi isn’t working. We rely on it to get work done and keep in touch via email. Facebook and Instagram, of course, rely on a good solid connection to the internet too. If the WiFi itself isn’t really broken, then there are a couple of quick things you can do to get it working again. First, is your device in Airplane mode or has the WiFi been turned off? On some laptops there is a simple switch (usually in the front) that is easy to accidentally turn off. On other machines you’ll need to hold the function key and “radio” key down at the same time to toggle it on or off. Tell your device to “forget” the connection, then reconnect and reenter your WiFi password. If you have access to the router, turn it off, wait 10 seconds, then turn it back on again. Then, relog into the wifi on your computer or other device. If you’re still not having any luck, call your Internet Service Provider (CenturyLink, Comcast, Xfinity, Rise Broadband, etc.). Let them know that your WiFi isn’t working. They should be able to tell you if it is something they can fix, or if you need to call in outside help. You’ve followed these steps, but still your WiFi isn’t working? Give us a call! 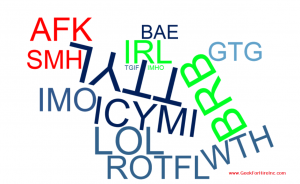 Are you ever mystified by some of the acronyms that show up in your text messages, or sometimes on Facebook as well? More than once I’ve had to look up an odd string of letters to figure out what they mean. TMSAISTI – That’s my story and I’m sticking to it. 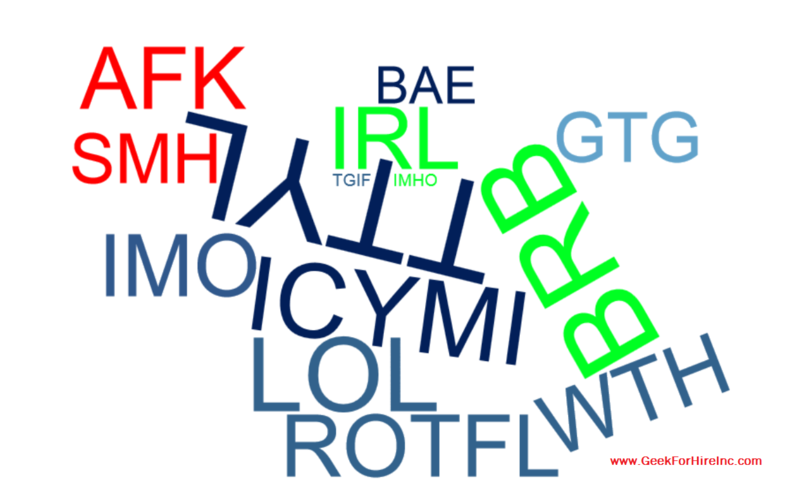 For parents wondering what their kids might be saying, here’s a list of sexting terms.